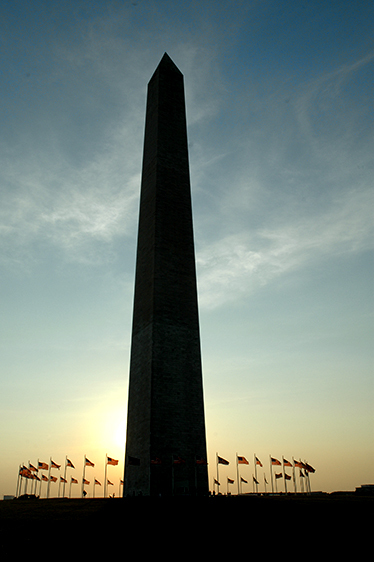 The Washington Monument: Opening Soon! The Washington Monument is the iconic structure of the city of Washington DC and I have been photographing it since 1999 when I first got serious about photography. Yet despite the numerous images I’ve made of it in the 15 years since then, I am somewhat embarrassed to say that I never made it to the top during that time. But even though I do have a few excuses—such as an earthquake—it serves no purpose to bore you with a recitation of them. Instead, I have seen the error of my ways and I fully intend to be up there as soon as possible when it re-opens next month. Details about the re-opening are below, but first a few highlights from the past 15 years are in order, not necessarily in a chronological order. 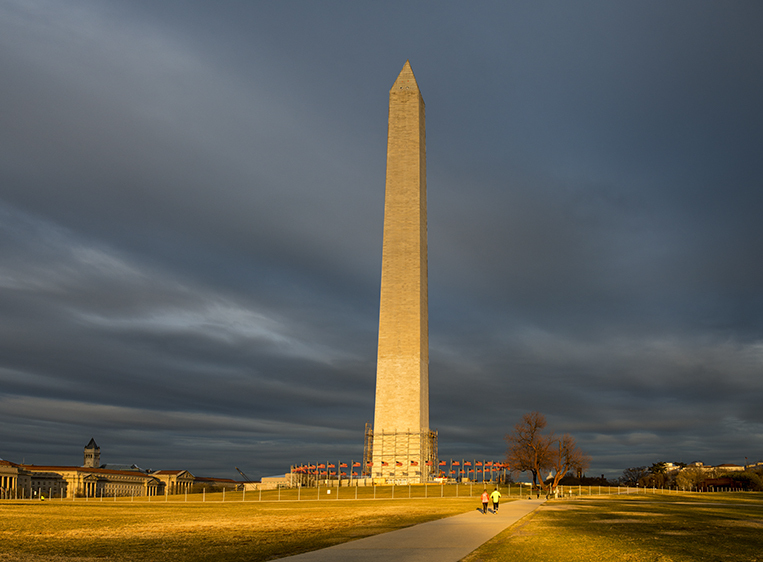 The Washington Monument originally was designed to be 600 feet tall and located at the intersection of a north-south line from the White House and an east-west line from the Capitol Building. In fact, neither happened. The ground was too soft at the intersection point so the site was moved about 500 feet to the east. Then funds ran short and construction was halted from 1854 until 1877. When construction resumed, a reconsideration of the height led to the adoption of the 10:1 height-to-base ratio of all Egyptian obelisks. The base was already about 55 feet so the height was changed to 555 feet. The east-west axis from the Capitol to the Washington Monument was extended further west in 1922 with the opening of the Lincoln Memorial, following the vision of the 1902 McMillan Plan for the National Mall. 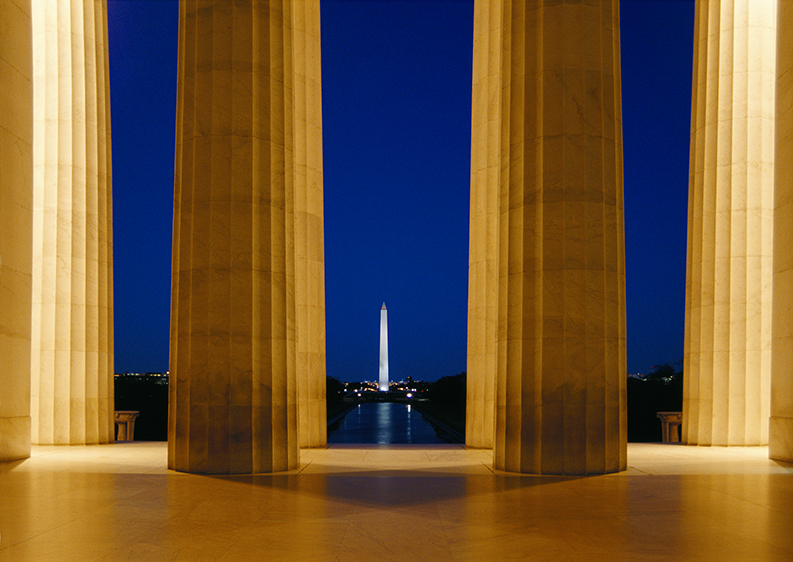 As shown in the image above, the Lincoln Memorial is centered on that axis with the opening facing toward the east. The Capitol Building is at the eastern terminus of the axis beyond the Washington Monument. When the Monument was completed in 1888, it became the world’s tallest structure, a title it held until 1889 when the Eiffel Tower was completed in Paris. However, it remains the world’s tallest stone structure and is the tallest building in Washington, DC. 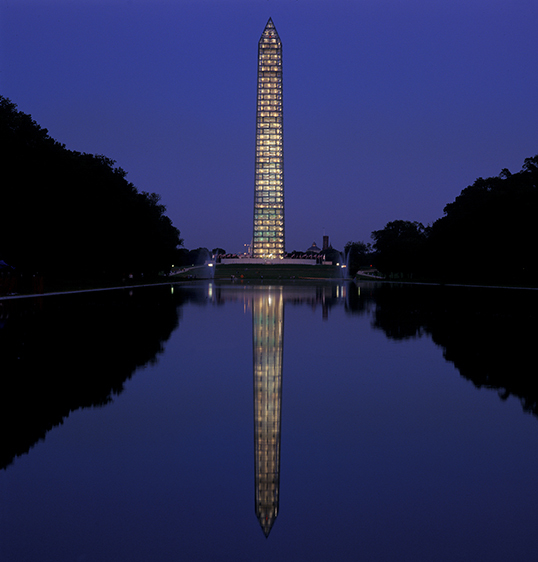 Over the years, the Monument has provided local photographers as an incredible backdrop for almost any occasion including the Kite Festival, the July 4 fireworks and the occasional lunar eclipse. But now the scaffolding is down and the structure soon again will be open for visitors. According to the National Park Service, the scheduled date for the opening is May 12th, and tickets can be made either in person at the Washington Monument Lodge on 15th Street or online in advance. Details can be found at the NPS website for the Monument. There is a small fee for the online service. I may not get a great picture when I get up there next month, but it won’t be because I didn’t get to the top. 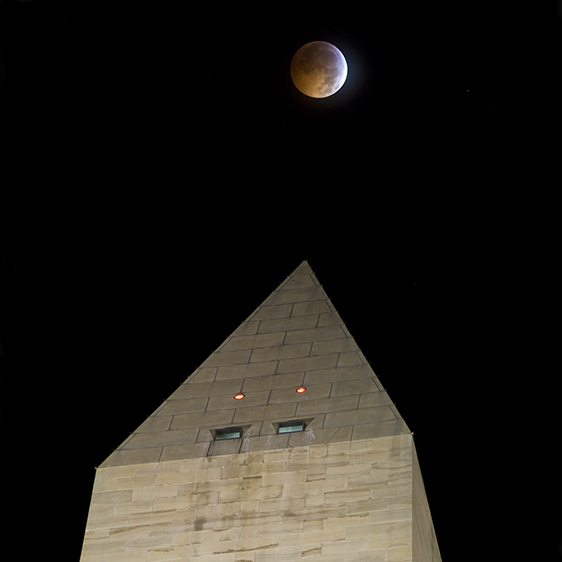 This entry was posted in Moon, Scouting Report, Washington DC and tagged DC, History, Lincoln Memorial, Lunar Eclipse, National Park Service, Nikon, Photography, Tips, travel, Washington, Washington Monument by Robin S. Kent. Bookmark the permalink. You know, I never realised this was older than the Lincoln Memorial – huh. I look forward to pictures of the view from the top! Thanks for your comments, I hope I get something worthwhile. One way or the other, I’ll have a story to post. I’ve been wanting to make it to the top myself! My first time in DC was the summer of 9/11 and my family just didn’t make the reservation in advance. I’ve been to DC about 7 times in the last 3 years and haven’t been able to go because of the earthquake! Thanks, Brendan. Hope you get there soon. And be sure to tell us about the experience. Thanks, Michele. That should be exciting for Briant. Highest point in the city, he’ll have bragging rights at school. Nice shots! It’s been years since I’ve been to Washington DC, I’m hoping I will visit again sometime soon. Maybe I can take pictures almost as good as yours. Thanks for checking on my blog and for your comments. They are much appreciated. I hope you can make it to DC soon, there is always something new here to see and do. In fact, that might be a good topic for a future post. Hope you’ll check back again. I am from Mclean, Va and when I was a child my friend and I walked down the stairs. It was fun! I wouldn’t do that now. Hi, Kendall, thanks for visiting my blog. I really enjoyed your paintings when I visited yours. Actually, the stairs have been closed for a while. So as long as the elevator doesn’t malfunction, they wouldn’t let you do it now. But that is a pretty impressive accomplishment to have, I must say. You are welcome! Thanks for looking at my work. I didn’t know the stairs were closed. We walked down them a long time ago. It was fun but it sure took a long time! No problem, Kendall, you have a really good style. As for the trip down the Monument, I imagine 55 flights would take a long time. I hope to get up there on May 13th, and should have a post about what happens shortly afterwards. These photos are amazing! I took a trip to DC the weekend after the earthquake and was so sad I couldn’t go up (or get to close). I hope to relocate to DC soon so it’s re-opening is perfect timing. Thanks very much for the comments. Your visit right after the earthquake was probably the worst timing possible, unluckily. Later, when the scaffolding went up, and the lighting was installed, it was an attractive sight at night. I hope your relocation here works out well for you. In the meantime, please check back occasionally to see other stories about the area.